Corporate Fleet Card When you use the Comdata MasterCard® Corporate Fleet Card for your fleet management, you’ll have maximum control, acceptance, and flexibility to manage all of your fleet expenses – including fuel, repairs, and more – at more than 600,000 locations. Improve control and reduce fuel costs by configuring automatic pump shut-off limits when the approved dollar amount for the fuel purchase is reached. Receive detailed transaction data and visibility into spending with the powerful real-time data of FleetAdvance, as well as level 3 transaction reporting (where available from the merchant)*. Minimize risks with Comdata’s state-of-the-art fraud management technology and enhanced authorization controls. Consolidate all fuel purchases, including retail, mobile, and bulk into a single program and single invoice to more effectively manage expenses. 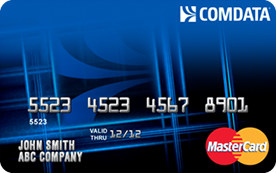 Enjoy the benefits that many of the top 10 commercial fleets are already experiencing with the Comdata MasterCard® Corporate Fleet Card. Fuel up at thousands of locations nationwide with the universal acceptance of MasterCard® and Comdata’s own proprietary network. Enjoy savings by leveraging fuel discounts at more than 20,000 locations nationwide. *The FleetAdvance mobile application and usage come free with your program enrollment. The FleetAdvance web application is free for the first 60 days. After 60 days, a monthly service charge will be billed to your account. To unsubscribe, call your Customer Support number. Program terms and conditions apply. Visit www.comdata.com/fuelcard/terms for details. Fees may apply in some cases, such as for optional services, late payments and/or credit risk. The Comdata MasterCard® is issued by Regions Bank, pursuant to a license by MasterCard® International Incorporated. MasterCard® is a registered trademark of MasterCard® International Incorporated. Comdata® is a registered trademark of Comdata Inc.